Since 2016: Elected member of the Koninklijke Hollandsche Maatschappij der Wetenschappen KHMW (Royal Holland Society of Sciences and Humanities). 2016: Nominated for ‘Beste Docent van het Jaar 2015’ (Best Educator of the year 2015) of the Faculty of Mathematics and Natural Sciences, University of Groningen. 2015: A Liber Amicorum appeared in honor of my 50th birthday: S. Ghosh and J. Szymanik (eds. ), The Facts Matter: Essays on Logic and Cognition in Honour of Rineke Verbrugge, College Publications, 2015. 2015: Also, a workshop Rineke @ 50 was organized at the University of Groningen on March 12th, 2015, by B. Arslan, H. de Weerd, Jakub Szymanik and Sujata Ghosh. 2013: Best Paper Award for the paper with N. Bulling and S. Ghosh: “Reaching your goals without spilling the beans: Boolean secrecy games”, at PRIMA 2013: Principles and Practice of Multi-Agent Systems. 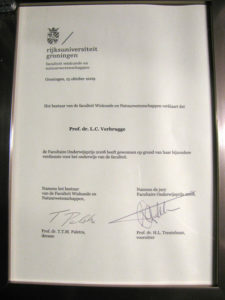 October 2009: Awarded prize for 'Beste Docent van het Jaar 2008' (Best Educator of the year 2008) of the Faculty of Mathematics and Natural Sciences, University of Groningen. 2006–2007: NIAS Fellowship awarded by the NIAS Fellows Selection Committee.